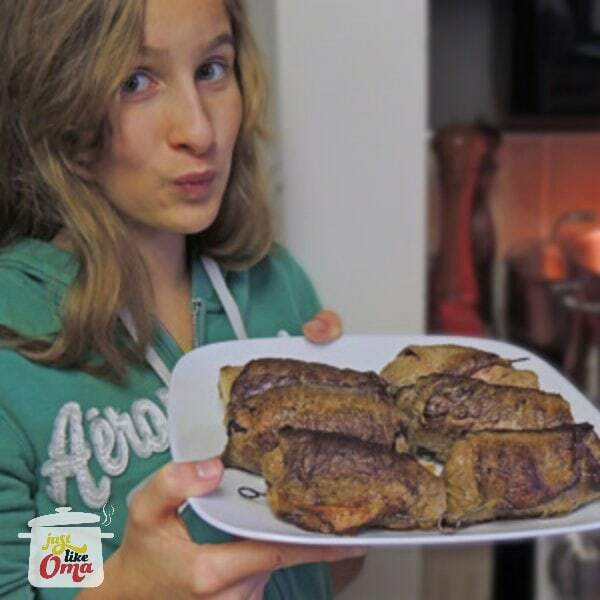 This beef Rouladen recipe, along with potato dumplings and red cabbage, is among our most cherished authentic German recipes. What could be better than to serve this as your traditional German Christmas food or other holidays or birthdays ... or anytime you have something special to celebrate. They are really quite easy to make. 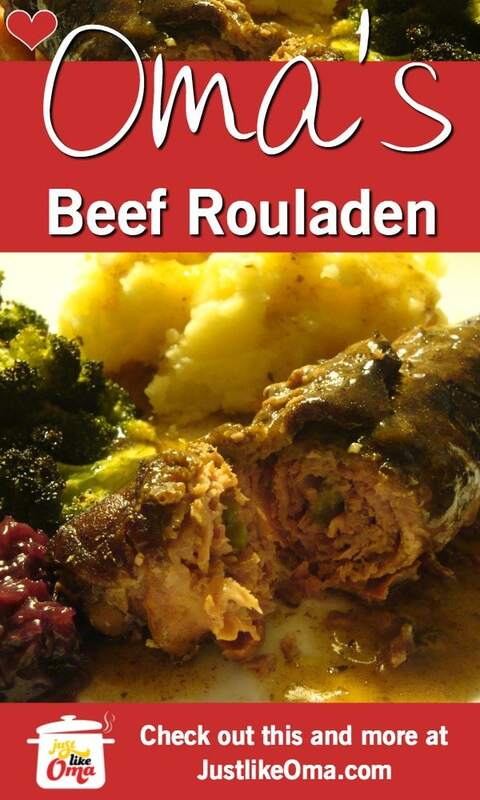 There are many versions of this braised beef Rouladen recipe, with a difference in filling being the usual change. Season beef slices with salt and freshly ground pepper. Thinly spread mustard on top of each slice. 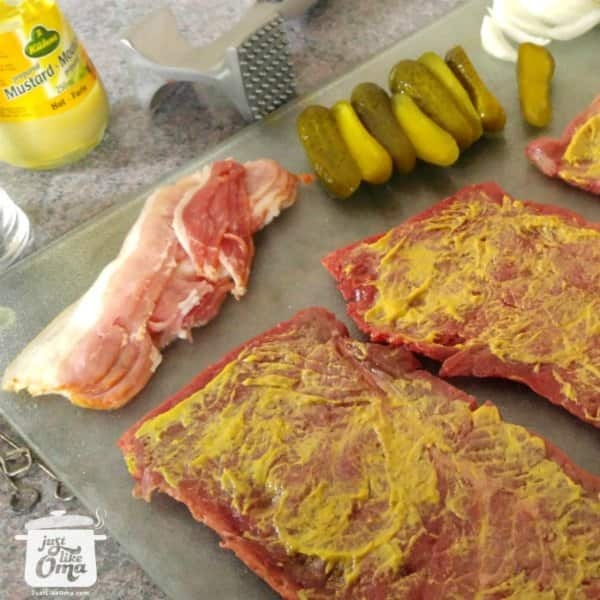 Divide bacon, pickle, and onion slices on one end of each slice. Roll up slices, tucking the ends in and securing with skewers, wooden cocktail picks, or thread. Heat butter in skillet. Brown rouladen well on all sides. Do not crowd rouladen in skillet, or they will not brown nicely. Do in small batches if necessary. Add extra butter if needed. Once all rouladen are well browned, add 1 - 2 cups of hot water, gently stirring up browned bits. Return all rouladen and any accumulated juices to skillet, bring to simmer and cover. Simmer for about 1½ hours. Remove rouladen. To thicken gravy, combine about 1 - 2 Tbsp corn starch in a little cold water and stir gently into cooking liquid until slightly thickened. Season gravy to taste with salt and freshly ground pepper. If you wish, add sour cream to the gravy. Have the butcher cut beef top round into thin slices, about ⅜ inch thick. Each roulade should measure at least 6 inches by 4 inches. Gently pound meat until it is about ⅛ to ¼ inch thick. Be careful not to put holes in the meat. The larger the roulade, the easier it is to roll up. Some add pickles, others don't. Some add other vegetables, others minimize the fillings. Use Black Forest ham instead of bacon. I usually make two rouladen for each person, but this really depends on the size of the top round slices I get from the butcher. Sometimes they are quite large and one roulade is all that's needed for one serving. But I find that even though one SHOULD be enough per person, because they are so good, most people like to take a second one. Or, often times they will share a second one with someone else. Because of this, I usually make as many as my budget allows, hoping for leftovers, because these taste so great the next day, heated gently in their gravy. Set up an assembly line to make the preparing of rouladen easier and quicker. 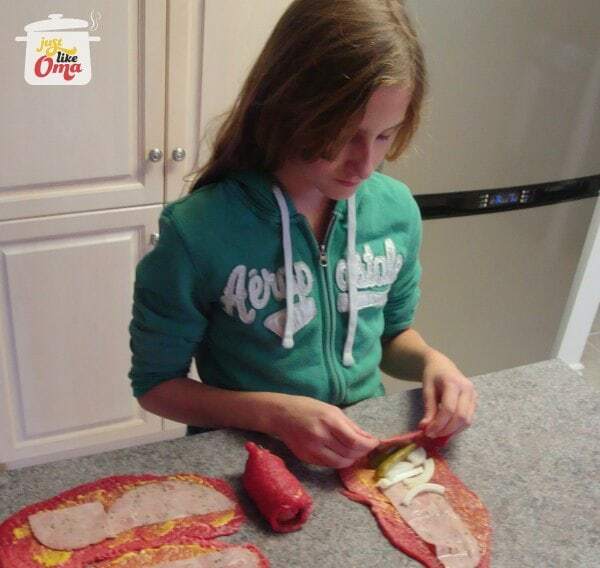 Alana making her rouladen. 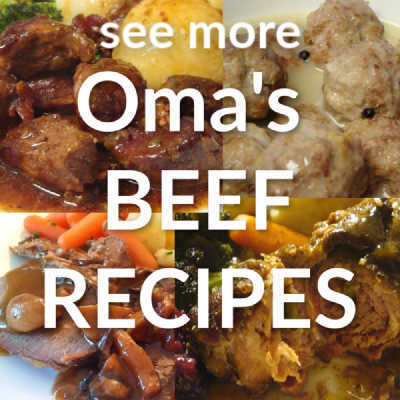 Instead of using bacon strips, she put a slice of Black Forest ham down the length of the rouladen. A delicious variation on the traditional recipe, one I'll be doing often. 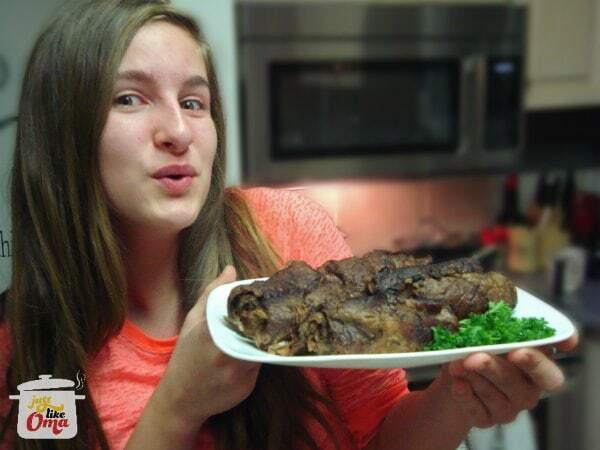 Here, my granddaughter, Alana, made them for her 15th birthday dinner party. I find it just as easy to make twice as many of these beef rolls as I need. The extras freeze well, as long as they are covered in their gravy. Thaw them in the fridge and then reheat. Now that's quick German food! Does your budget say "too expensive" to make these German rouladen often? Want something a bit easier for everyday? Try my own flatladen recipe. Created by me for my boys. We ALL love it! Same great rouladen and gravy taste without all the work or expense. Make every day a WORD-filled day! 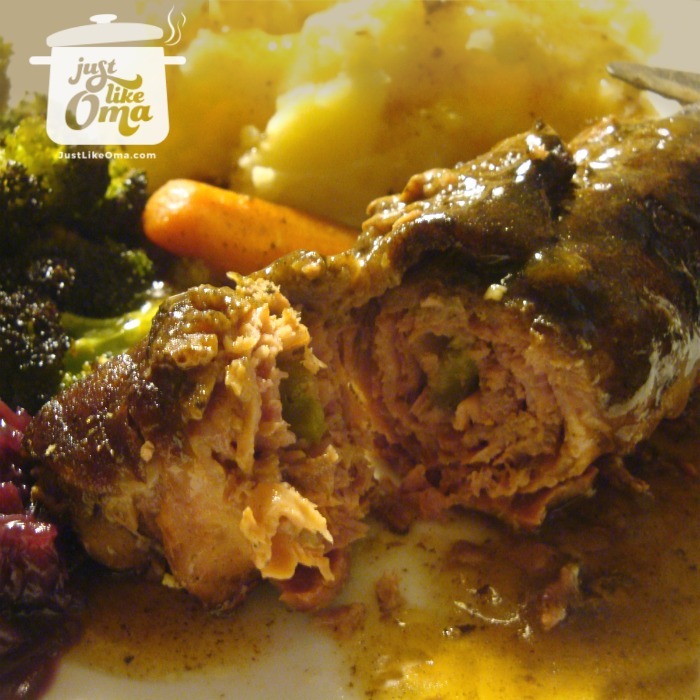 This beef rouladen recipe, along with potato dumplings and red cabbage, are among our most cherished authentic German recipes. Easy? Yes, even my granddaughter makes them!